I'm so glad that you stopped by today! 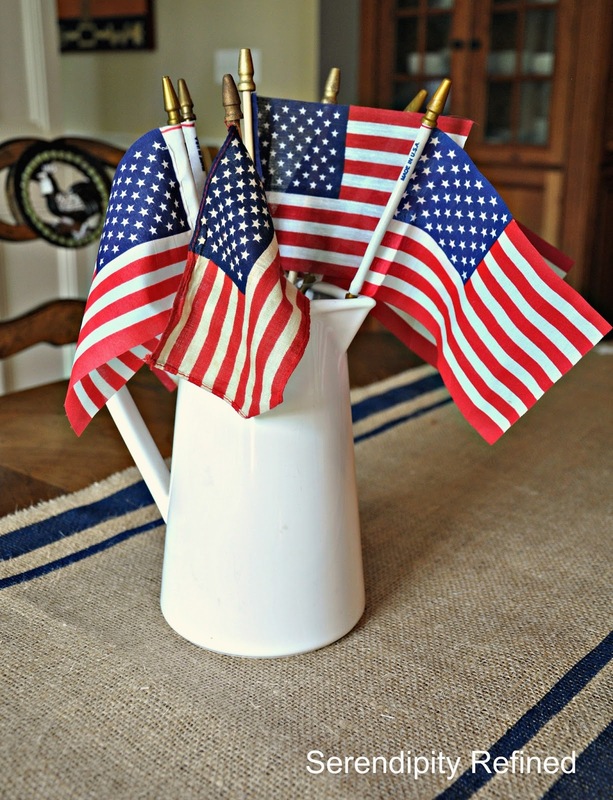 Happy "almost" July 4th! First, let me say that I can't believe that it's JULY already, can you!? Today, I'm sharing a quick and easy DIY project: A Patriotic, no sew, stenciled burlap table runner with grain sack stripes. 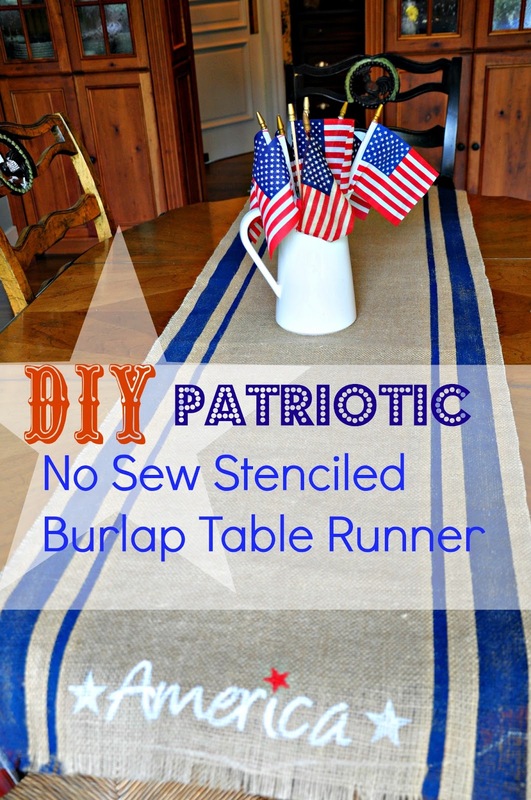 It's my favorite kind of project...the one that's free...and can be done in under an hour! That's my kitchen range hood. Are you beginning to see the pattern? 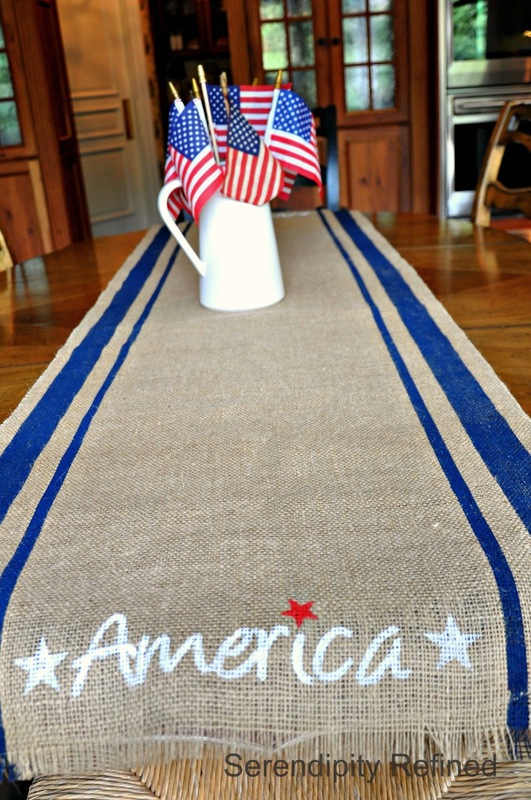 If you still don't believe me, take a look back at the post that I did about my 2012 4th of July Decor. 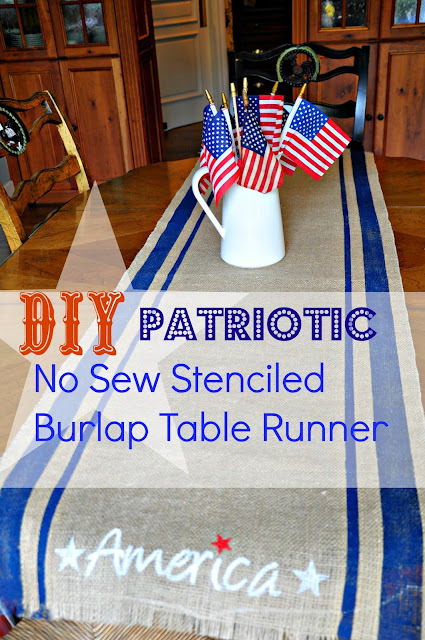 When it dawned on me that the 4th of July is right around the corner and there's not one single flag, not one bunting, not even a red, white, or blue napkin that managed to escape from my whirlwind cleaning spree, I realized that I had a problem! 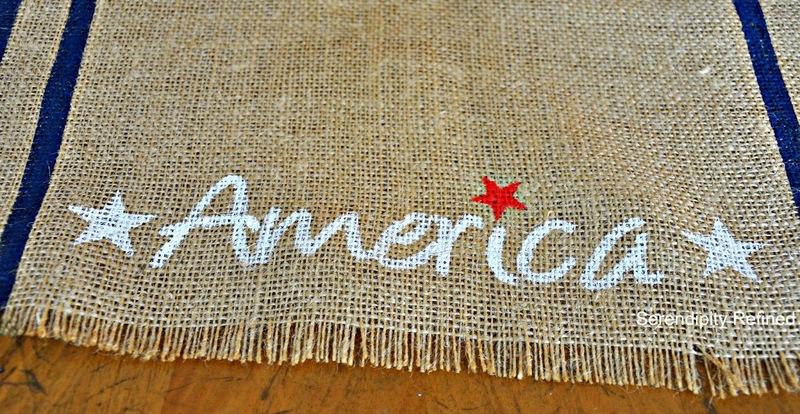 It's a good thing that I still had some burlap hanging around in the drawer in my nearly empty studio! I also managed to find a little tape...and some craft paint. 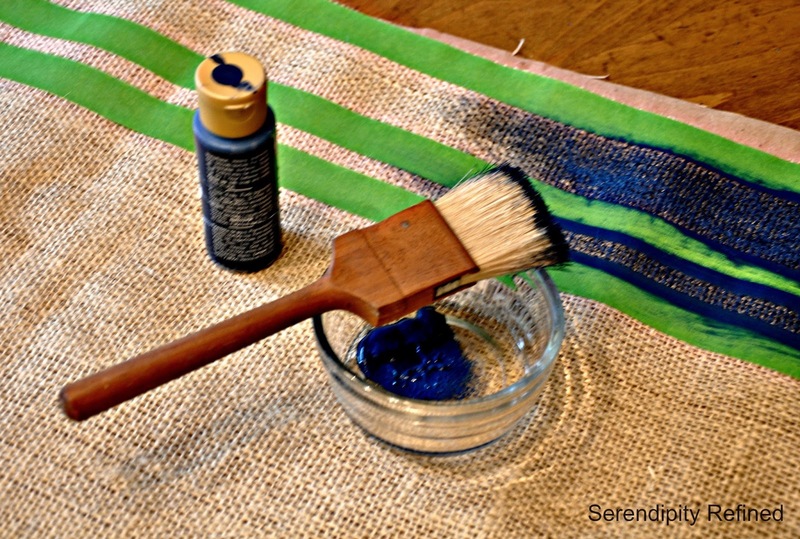 I even found some paint brushes! First, I cut the burlap to the length and width that I wanted and made a little fringe on the ends by removing a few strings. NO SEWING (don't get me wrong, I could sew...the machine wouldn't fit into the storage locker.) 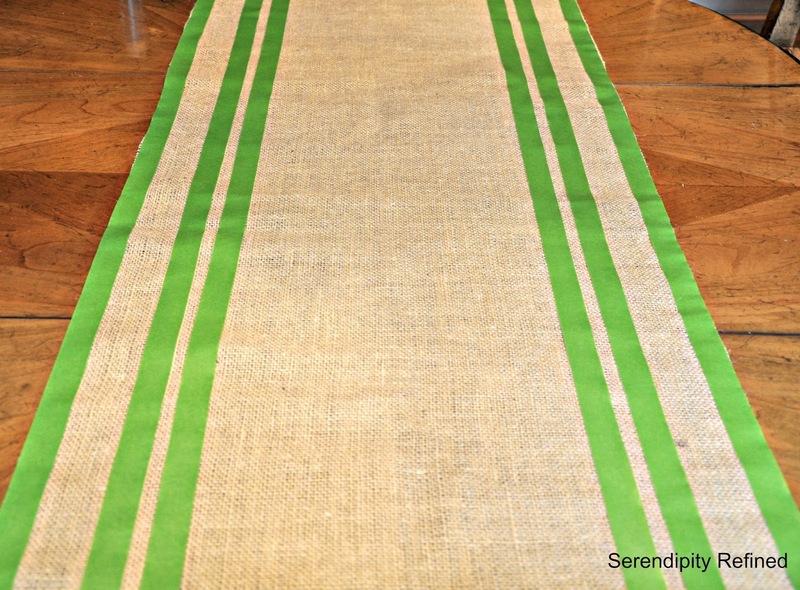 Then, I taped off a wide stripe and a small stripe to mimic a grain sack stripe. I painted them navy blue with craft paint. 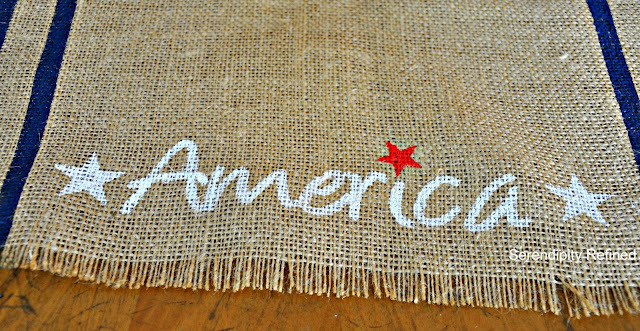 Then I painted the word, "America" using a small, flat brush and white paint. 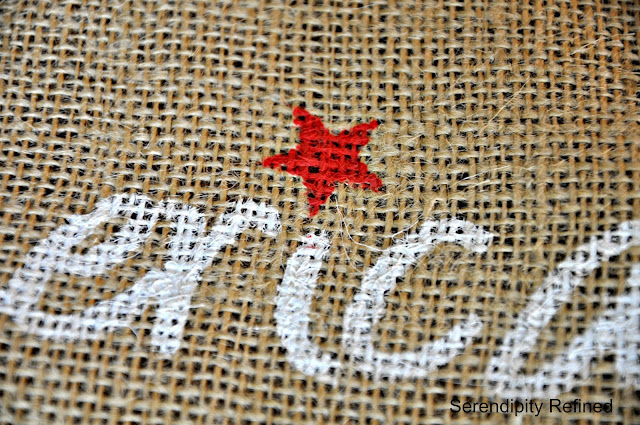 I also found a star stencil that was hidden in a drawer and used it to stencil the white and red stars. I just love the little red star above the "i". What a difference having just a little 4th of July decor in our home makes. Of course, I'd still prefer to have things like this decorating my family room. 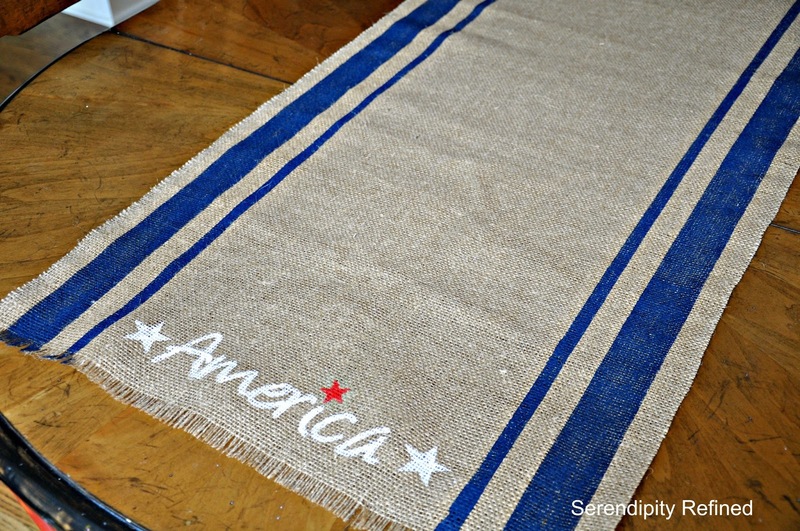 But for right now, a burlap table runner with some grain sack stripes, a couple of stars, and the word , "America" is enough ...unless I find more flags sometime between now and tomorrow!